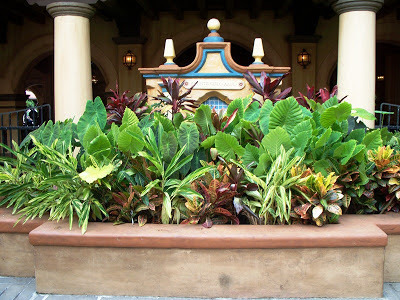 I weighed in on what I thought could be done to improve the garden of The American Adventure during the Epcot International Flower and Garden Festival. Mr. and Mrs. Easter Bunny stopped by ahead of today's Easter holiday to share their wardrobe choices from 1977! There is very little food in Walt Disney World that excites me and entices me more than the Bread Service at Sanaa. The World News Roundtable showed up prepared with their opinions on the handwiches, new Iron Man monorail wrap, Roger Rabbit back in the parks, passholder's RFID accessibility, and new Marathon Weekend races. We explored the engaging activities of Canada's recently added Disney Vacation Club kiosk. Silent Saturday uncovered a pirate fountain known as Fuente Cielo Azul. 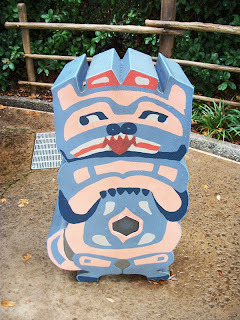 Heather Sievers tells the tale of her dinner inside Disneyland’s Haunted Mansion at The Disney Food Blog. A primer for what is to come, FoxxFur has a given readers of Passport to Dream Old & New a brief introduction to early Walt Disney World music. J. Jeff Kober explores the relationship of technology and the Disney Parks and what may be just around the corner in Disney at Work. Tamu Tamu Refreshments is on the menu for Melissa Knight Coulter and Disney on Wheels. Melissa Sue Sorrells Galley offers up New York with a Disney attitude at Mouse on the Mind. Readers get a bit of background from Adam and Andrew on the Mexico pyramid at the Disney Hipster Blog. Sarah Holodick samples the two new cone-wiches that have come to Walt Disney World in Eating WDW. FYI, I’m still calling them handwiches, I don’t care what the menu says! Doing his usual exhaustive study of new eats and treats, Andy Jackson weighs in on the offerings of Flower and Garden at Eating (and Drnking) around the World. George Taylor has some terrific photographs from the Tower of Terror, and its occupants, in 1994 on Imaginerding. It’s a bit off property, but I can't help showing that Nicole Siscaretti visited the Star Wars: Where Science Meets Imagination for Sparkly Ever After. Richard Tobin reminds us all of what made the original Star Tours so, well, original at Mouse Troop. Studios Central and Matt Hochberg point the spotlight on Hey Howdy Hey Takeaway. I stopped by the WDW Radio Show last week to chat with Lou Mongello about the vacant spaces of Walt Disney World. We put on our Armchair Imagineering hats and tried to come up with some grand ideas about just what could be done with these abandoned areas. Stop by and give Episode #317 a listen. It'll be a lot of fun, I promise! 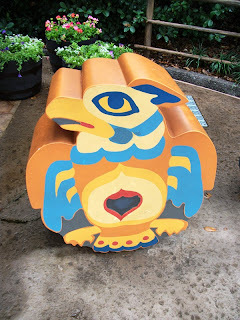 Walt Disney World isn’t marketing to families about the perfect memorial souvenir, whether it is a thumbnail plaque on large stone monoliths or a paver in a walkway, the way they used to. Instead, the current strategy involves motivating families to prepare for decades worth of vacations. While the Disney Vacation Club may be the worst kept secret in Walt Disney World, there are some advantages to the kiosks popping up around every corner. Take for instance this little shack in Canada. 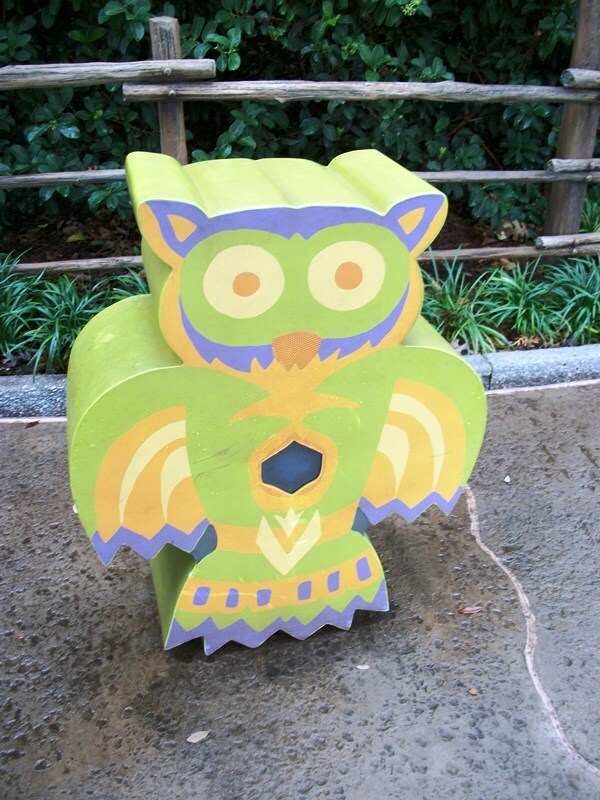 Yes, its main purpose is to sell families on the idea of Disney Vacation Club ownership, but what surrounds the outpost is enough to keep young children engaged for a few minutes. In the past, the set-ups were not very child friendly and children would get antsy after a few moments of marveling at the stickers that they had been presented with. 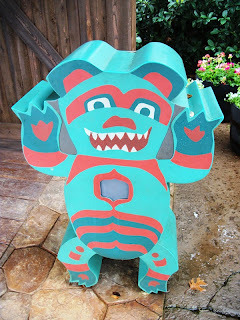 While the two activities presented in the Canada kiosk are not as time consuming as maybe a Kidcot or Kids Discovery Club can be, they are definitely worth a look. 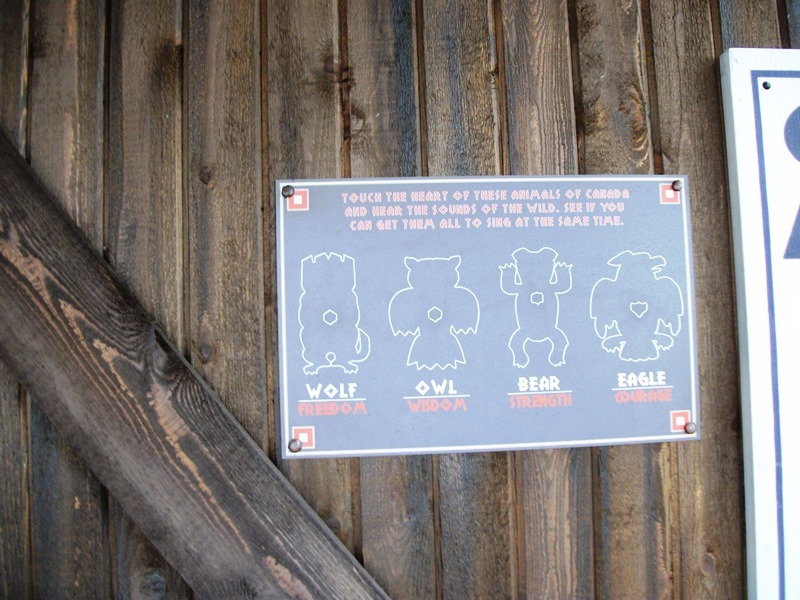 Both of the activities start inside the shack itself with small tin signs that have been tacked to the walls. 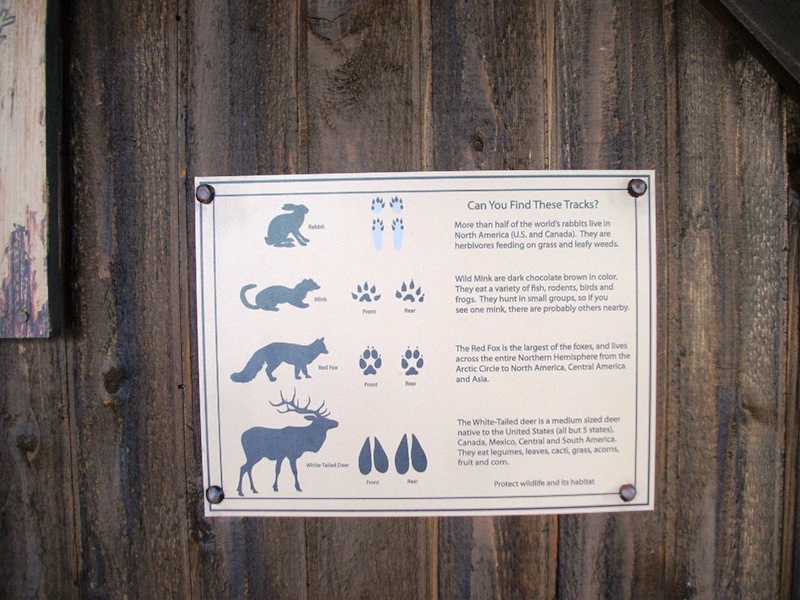 The first of which talks about creatures native to the wilds of North America, specifically the Red Fox, Mink, Rabbit, and White-Tailed Deer, and their eating, grouping, and other habits. 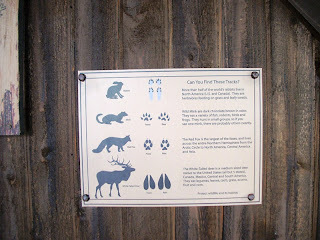 The sign include this brief introduction to the animals, a silhouette of each animal, and the print their paw or hoof leaves behind. 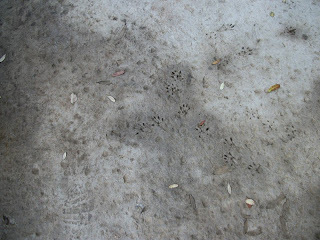 This print is critical because the sign also asks if you can find these tracks. Find them where, you ask? Why, on the walkway between the shed and the World Showcase promenade, of course. The first exercise requires some attention not only to the sign, but also to the pavement below guests’ feet. 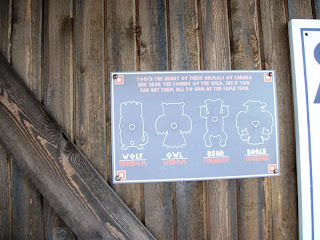 The second sign, while just as likely to be overlooked, features an activity that most guests are going to see and get right away. 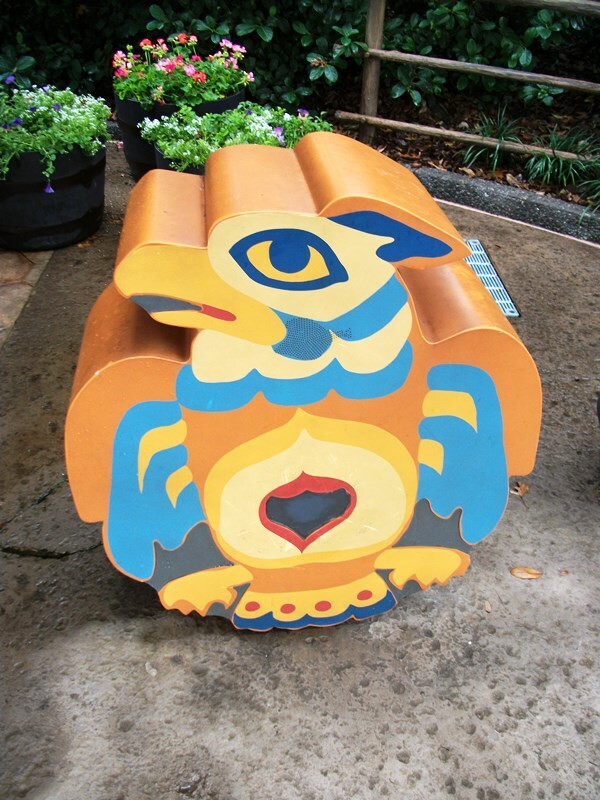 It features four totems and what they embody, included are the Bear (Strength), Owl (Wisdom), Wolf (Freedom), and Eagle (Courage). For those of you who remember the movie, these are clearly not your Brother Bear’s totems. The key comes when children touch the heart of each animal, a touch that releases the creature’s distinct call. The goal of trying to get the owl to hoot, bear to growl, the eagle to screech, and the wolf to howl at the same time will take at least two people, but it gets very loud, very quickly when you succeed. 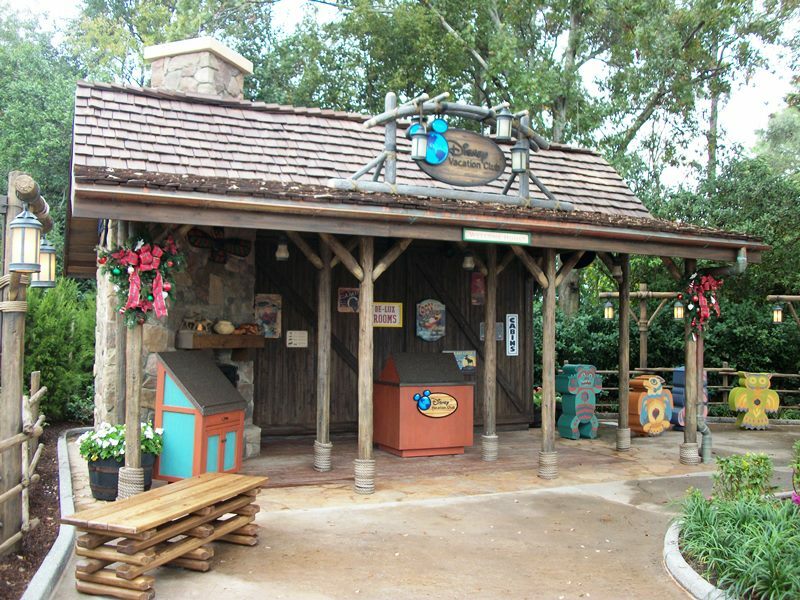 It may seem that Walt Disney World will not be content until every corner is filled with a Disney Vacation Club kiosk, but at least they are considering how these stands blend in with their surroundings and what they can offer to smaller guests. Canada, for one, is a place for little ones to play, if only for a few moments. Roundtable Contributors: Elizabeth Caran (Outlander Travel), Alan Mize, Melissa Sue Sorrells Galley (Mouse on the Mind), Blake Taylor (BlakeOnline.com), Andrew (Disney Hipsters Blog), and yours truly. If you're a giant Disney nerd (guilty over here), then you probably know about (or even ate) Handwiches. In case you don't, here's the short version: in the 1980s, Disney pioneered a conical bread product for a sandwich that Park-goers could carry in one hand. You know, so they could keep moving, keep enjoying the Parks and keep spending money while they were eating. 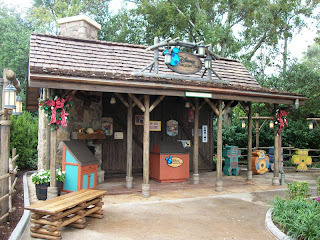 Though it never quite caught on back then, the Handwiches made a comeback last summer as Conewiches in Carsland. 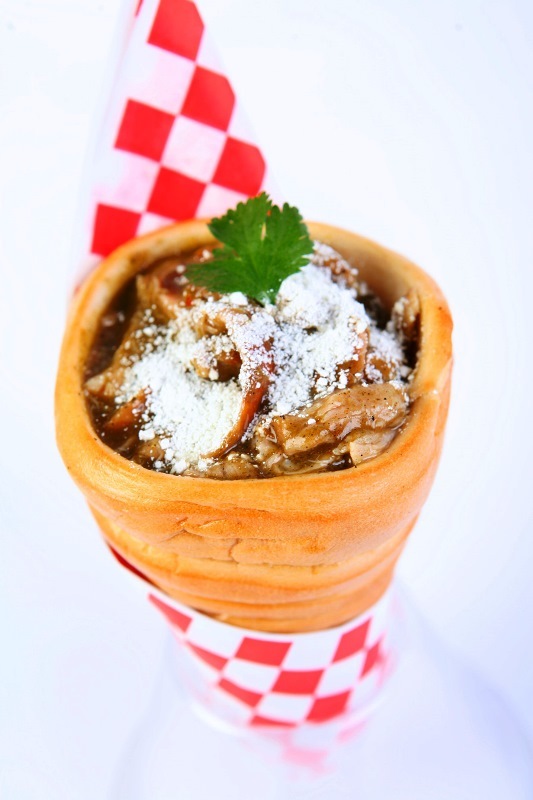 At the Chili Cone Queso stand, guests can order a variety of cone-shaped sandwiches. Which is wonderful and exciting but ... I can't afford to fly to California just for a sandwich! Luckily, Disney is bringing the single-handed sandwiches to Orlando's Downtown Disney! Rejoice, Handwich fans! And join me in line, won't you? While visiting Walt Disney World last week, I was pleasantly surprised when the new themed monorail pulled into the station. Dubbed the “Ironrail” or "Iron Manorail" by many, monorail black has been wrapped in order to promote Iron Man 3. This isn’t the first time that Disney has wrapped a monorail with an advertisement to promote a new movie. There has also been the “Tronorail” and the “Avengerail,” and all three of these monorail versions have drawn mixed responses from the online community. Having seen Ironrail in person, I personally thought it was pretty cool looking. While many complain that a large picture of Iron Man on the side of the monorail train can mess with the theming of the monorail, I personally don’t see what there is to get that upset about. While some view the monorail as an attraction in and of itself, ultimately the monorail is nothing more than a mode of transportation like the ferry boats or the buses. It’s not as if they’re wrapping the pirate ships on Peter Pan’s Flight or the logs on Splash Mountain. The monorail is still a “futuristic” way to get around the WDW resort, regardless of whether it has a black stripe or whether it says Stark Industries so the theming still fits for me. Now, would I want the Iron Man 3 wrap to stay around forever? No, I wouldn’t. But for a temporary promotion of their next big movie, I don’t have any problems seeing Iron Man fly around the Seven Seas Lagoon. Hey, guess what guys? Disney has the capability to wrap its legendary monorails as a tie in to current movie franchises! I bet you didn't know that did you? Wait...sorry, I didn't mean to lay on the sarcasm so densely. Of course you realize this, because they're getting old really quickly. Disney World has, yet again wrapped a monorail. This time as a promotional tool for the upcoming film Iron Man 3. I have no problem with Disney's acquisition of Marvel a few years ago. If anything I applaud their foresight into that brand. However, I like to maintain a sense of pride in the clean retro/chic look of the monorails. This is the third or fourth incarnation of these giant ads in the last few years, and I dont remember a recent trip that DIDNT involve saying "Oh, hey...there goes blahblahblah-orail." I don't like them. Tacky. Icky. Gross. There are many Easter festivities on both coasts this week as part of Limited Time Magic, but perhaps the most fullfilling treat of them all is a surprise I'm sure no one expected: the return of Roget Rabbit. Yes, the Roger Rabbit, the one you haven't seen in the parks for a month of Sundays (...times about 120). Sure, you have permission to jump up and down and do two laps around your house! Go on! Are you back now? Ok, good. Roger appears this week at Disneyland on Main Street USA along with other rabbit characters to do the Bunny Hop at 3:30 and 6:30, 30 minutes prior to the parade. It may not be a formal meet & greet, but fans will take what they get with this popular yet extremely elusive character! Roger was last seen in the US during May 2012's Fantasmic! 20th anniversary event at Disneyland. Before that, though, his last appearance had to have been close to a decade ago. I didn't see Who Framed Roger Rabbit until 2004, but I was familiar with the titular character long before that. Growing up in the '90s, to me Roger was just as much part of Mickey and the gang as Chip & Dale or Pluto. Due to his popularity, that's how much prominence Disney gave him in the parks and in promotional materials (a bit like Stitch, in a way). That's part of what makes his sudden disappearance off the face of the earth so bizarre. I sure hope his recent surprise appearances are an indication of more future use. P-p-p-p-p-lease, Disney! When you are at Epcot during this time period, you should bring your paper pass and valid ID to the Odyssey Center. 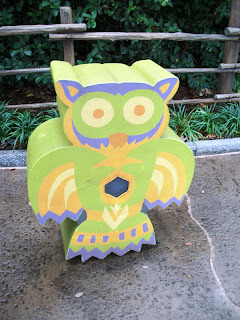 If you don't know where that is, turn in your Disney fan card right now! No no... just kidding. It's between Test Track and Mexico. This is the only place where you can complete your exchange. You cannot go to the ticket windows or the Downtown Disney Guest Services center to do this. And the Odyssey Center is only open during regular park hours (not Extra Magic Hours). I was really hoping to get a MagicBand bracelet rather than a card, but Disney promises there will be more information soon on when those will be available. As more and more photos begin to leak of what the bracelets look like and some of the premium options you can buy if you want to personalize your MagicBand a bit, I am really intrigued and looking forward to actually trying one out. They look like they might be hot and sweaty on a mid-summer day, but I will reserve judgement for now. In the meantime, I am thrilled that as of my next trip to the park in late April, I will be able to use the (presumably) faster new turnstiles and zip right back to my favorite new Epcot cocktail... Tipsy Ducks in Love. Many long-time runners associated with the Run Disney events have been self-bestowing the Dopey title upon themselves for a couple of years. Previously, people granted themselves the unofficial status of a Dopey finisher if they completed the 5K, Half Marathon, and Full Marathon on three consecutive days. There was a hope that following the immense popularity of such fan created terminology that next year they would officially recognize Dopey participants. 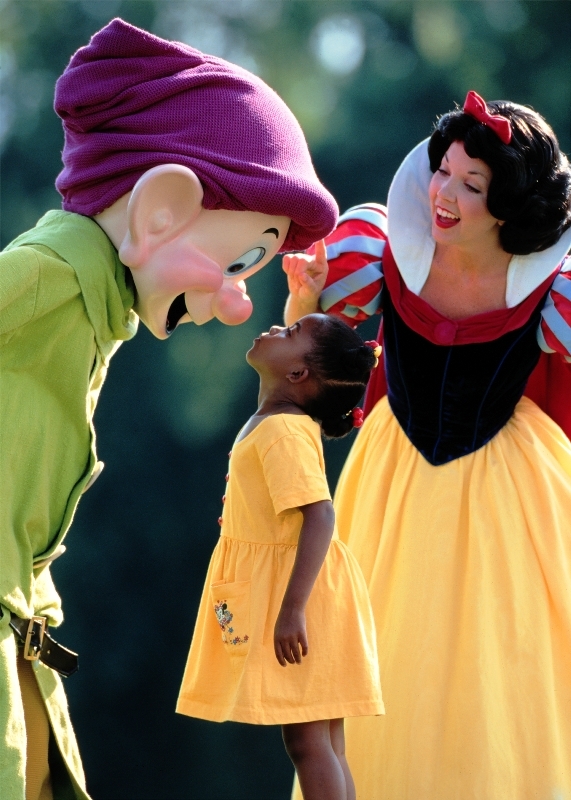 My lingering question on the matter was how would they address those who have previously considered themselves Dopey? Run Disney cleverly avoided this pitfall by changing the parameters by which a runner could gain the Dopey recognition. That is to say that if you are a truly dopey runner, you’re going to have to go a bit further to prove it. The 5K will be backed up to Thursday to allow Friday to host a 10K race. By adding another race into the mix, it gives previous long-term dedicated participants to finally claim a Dopey medal, but Run Disney gets to claim it as a previously unobtainable designation. I am concerned that untested runners will jump at a chance to grab the inaugural medal of the event and not consider the health risks and consequences. Heck, I myself want to jump at the chance, but I know that this isn’t the year for me to ramp up to such a drastic level. I am thrilled for those who are used to these types of distances to have a chance to prove just how dopey they are, but I hope that everyone weighs the pros and cons of such an undertaking before they step out on the course. Bread has a lot of standing in our society. We say we should break bread when we want to have a meeting and we compare innovations to sliced bread. The fact of the matter is there are few things simpler and yet ingrained in our culture than bread. At Sanaa they offer a bread service that is the perfect way, night or day, to sample the best a culture has to offer while enjoying the food staple we all know and love. The Bread Service gives you three breads and three accompaniments from a selection of five breads and nine trimmings. For the bread section, guests have a choice between Traditional Naan, Garlic Ginger Naan, Spiced Naan, Onion Kulcha, and Pappadum. For the uninitiated naan is a flatbread, as is kulcha, the difference is naan uses yeast and kulcha uses baking powder/soda. Pappadum is a thin, cracker-like bread, comprised of chickpeas. For the accompaniments guests can choose between Red Chile Sambal, Cucumber Raita, Coriander Chutney, Mango Chutney, Coconut Chutney, Garlic Pickle, Spicy Jalapeño-Lime Pickle, Roasted Red Bell Pepper Hummus, and Tamarind Chutney. We never pass up a chance to sit down and spend some quality time with the bread service, but let’s just run through our latest sampling for today. Garlic Naan, Onion Kulcha, and Pappadum were our selections for breads and our accompaniments were our Red Chile Sambal, Coconut Chutney, Spicy Jalapeño-Lime Pickle. 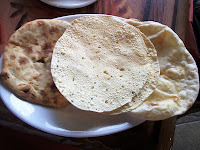 The Garlic Naan and Onion Kulcha were both pillowy and crispy with some great root flavors from their garlic and onion. The Pappadum was brittle in the best of ways with a nutty taste to it. If it isn’t already obvious, we like heat in our household. 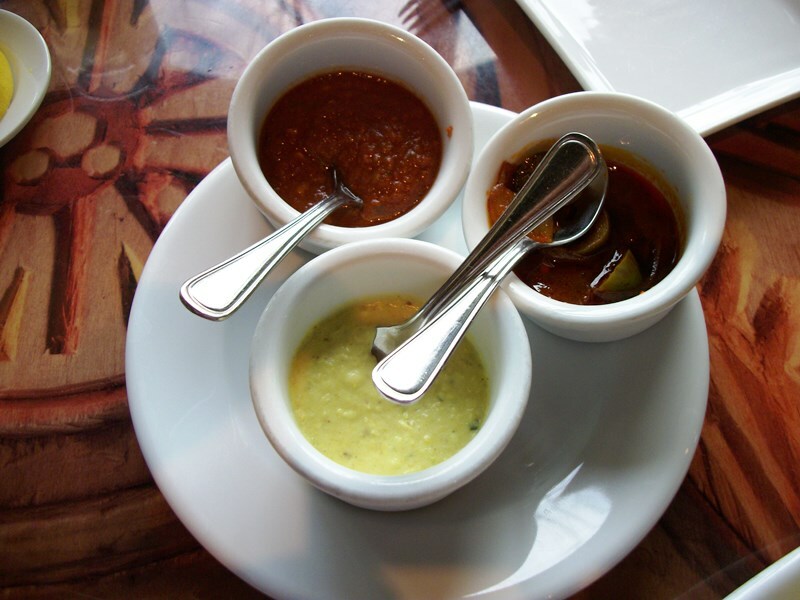 The Red Chile Sambal is a paste that brings the heat, but the Spicy Jalapeño-Lime Pickle has a slow heat that will build as you consume more and most certainly put some sweat on the brow. The Coconut Chutney is creamy and cool, and will bring relief to your scorched tongue. There is not a bad pairing of breads and accompaniments with Sanaa’s Bread Service. Every flavor has been methodically considered and brings out the best of its ingredients. There are plenty of reasons to visit Sanaa, but there is none closer to home and our hearts than the Bread Service. Give it a try some time, I promise you your stomach and taste buds will thank you! 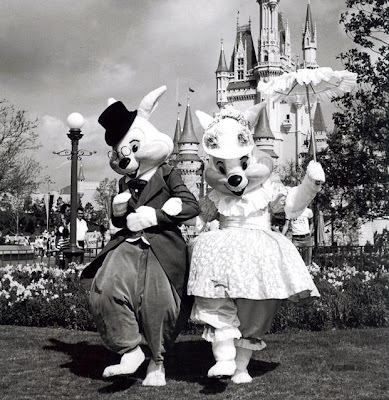 Their costumes may have been tweaked here and there over the past several decades, but Mr. and Mrs. Easter Bunny never fail to hop into Walt Disney World during the spring! Here they are in 1977 just in their Main Street, U.S.A. best! EASTER PARADE -- Dressed in their Easter best, Mr. and Mrs. Easter Bunny are ready to lead an old-fashioned Easter Sunday Parade at Walt Disney World’s Magic Kingdom. Extended operating hours during the holiday period, April 2 – 16, fireworks and special entertainment, await the many college students and families planning to vacation at the theme park.